Erlanger Gardens, 2 – 6 p.m.
Students and families are invited to learn about MU’s Global Education opportunities directly from faculty, staff, study abroad student alumni, and representatives from our partners abroad. More information on all of our programs can be found on the Global Education Office web site. 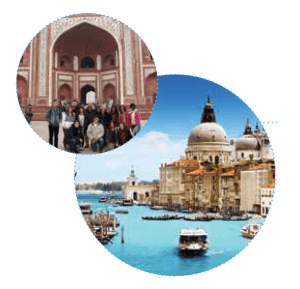 Discuss Global Education academics, accommodations, financial aid, safety and health with MU’s experts leading Study Abroad, Global Seminars, and Global Experience programs at the Study Abroad Fair. Professor Vincent DiMattio celebrates 50 years in Monmouth’s Department of Art & Design with a retrospective exhibition. He has shown work internationally in Spain, Puerto Rico, and Mexico, as well as at home throughout New Jersey. In 1999, his 30-year MU Retrospective Exhibition, was shown on campus with selections serving as his first New York City retrospective at the Susan Berke Gallery. In 2005, he received a grant for the completion of over 60 “tube paintings” which were showcased at Brookdale Community College. In addition to being named distinguished professor in 2013, he has been honored with an art scholarship in his name and Monmouth’s DiMattio Gallery. Free and open to the public. Room 104, Wilson Hall 6 – 7 p.m.
Study Abroad has rapidly become an important part of the American college student’s experience. This workshop will help parents become more familiar with the ins and outs of study abroad, including its academic components, the financial commitments, and the tremendous transformative impact the experience has upon undergraduate students. Light dinner will be served. Please RSVP to geo@monmouth.edu or 732-923-4768 by September 21, 2018. Tickets: Adults $40, $50; Children $20, $25 – Students get FREE tickets to Performing Arts shows and can bring one guest for $5. A season 8 finalist on America’s Got Talent, Catapult captivates audiences with shadow dancing and the ability of the troupe’s dancers to transform their bodies into seemingly impossible images. The Catapult dancers work behind a screen to create dancing shadow silhouettes of shapes from the natural and built world. Be amazed as you watch them transform into a mountain, an elephant, a dragon, even a helicopter! Packed with hundreds of shape transformations, this family friendly show is full of humor, emotion and engaging stories. Anacon Hall, Student Center 8:30 p.m.
Join the fun and the chance to win gift cards to local restaurants for your student to enjoy! Bingo is free and snacks are provided. Seating is limited.